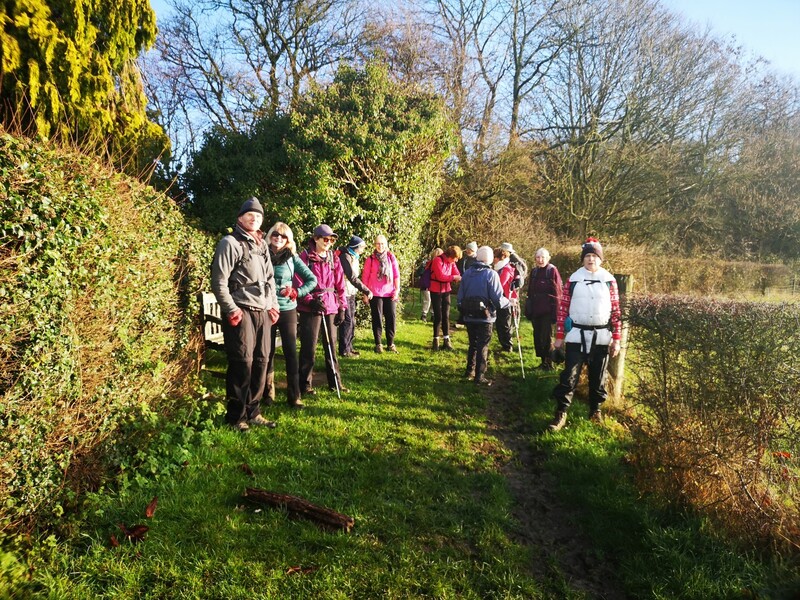 There were two walks organised: the "A" walk starting at 08:30, a 14-mile walk at a good pace getting back in time for festivities in Hambleden village hall commencing at 14:00; and the "B" walk starting at 09:00, a 12-mile walk and once again back at the hall for 14:00. Graham Croucher led the "A" walk with a total of 17 walkers and I led the "B" walk with once again a total of 17 walkers. During the night there had been some rain but by early morning the day dawned brightly with some sunshine although very cold. For the "B" walk I decided to head for the barn at Turville Heath with my thinking being that no matter what the weather we will have a dry stop. My route was circular, heading up to the Round House farm, on to Southend then Turville Heath; on the way back it was down to Skirmett, up to St Katherines's of Parmoor, on to Rockwell End then to Hambleden. We did stop for a brief history lesson at St Katherine's which is steeped in history: St. Katherine's Parmoor, Retreat House, Conference Centre, B & B. 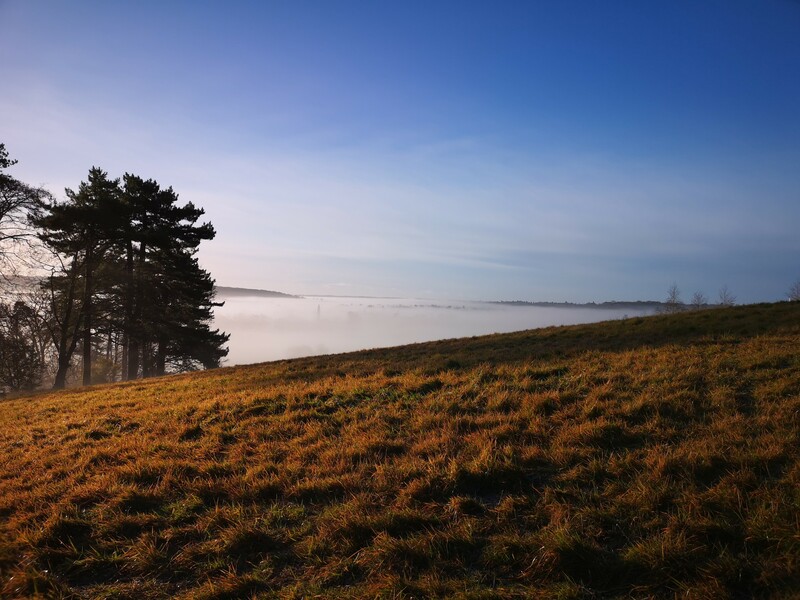 What was so nice about the walk, other than the fact that the company was great and we were all in good spirit, was the view as we climbed Reservoir Hill (pictures 1 & 2). At the barn at Turville Heath we had our stop with some people sitting in and others enjoying the fresh winter air sitting on the benches outside. 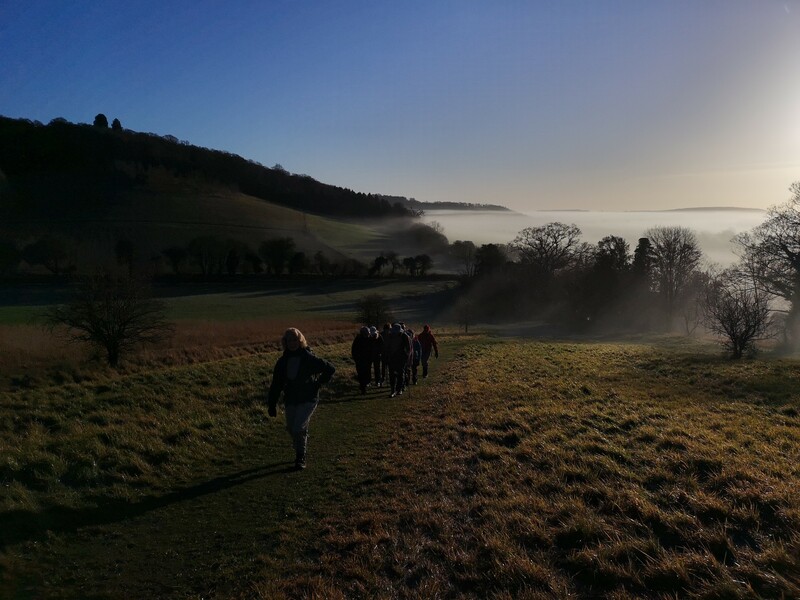 The walk back was good with only one significant hill to ascend and we reached Hambleden for 13:45, only just pipped by the "A" team. 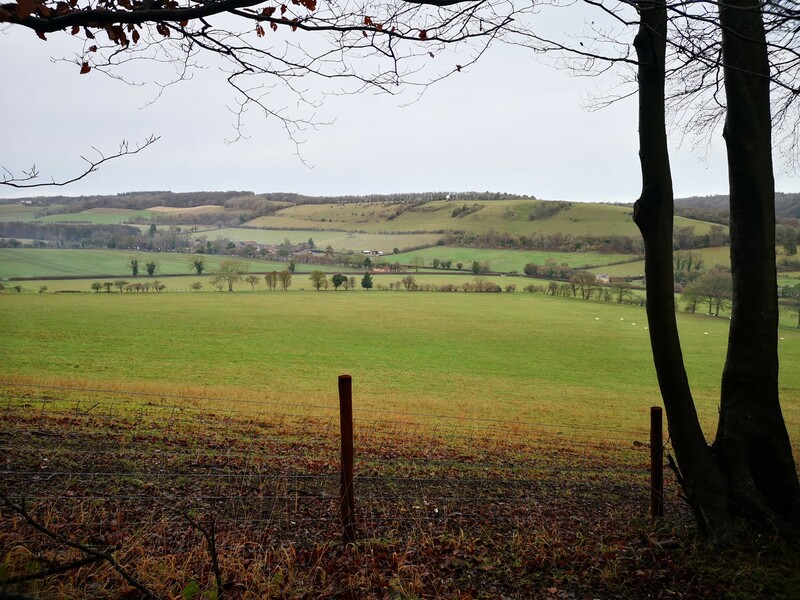 The "A" walk went up Pheasant's Hill and over to Bovingdon Green, where it turned along the edge of Pullingshill Wood (which contains trenches used for training during World War I). A trip through an Iron Age fort led to Medmenham and back to Mill End. 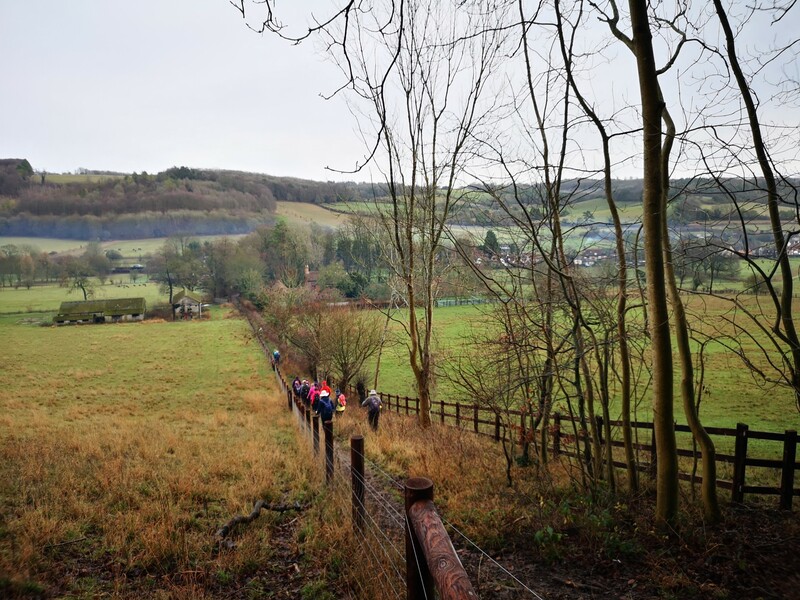 This walk also climbed Reservoir Hill (a change to the original route since the pace was too quick, necessitating an extra mile) and passed through both Woodend farms before returning down the valley. In the village hall we all chatted for a while before taking our places for lunch. The food was good with lasagna or a vegetable alternative, but for me the puddings were a gastronomic delight, having what I would call sticky toffee pudding with lashings of ice cream. I take my hat off to the chefs, it was like a Master chef masterclass. Between courses we had a game of picture bingo; there were some winners but none on the table I was sitting at. 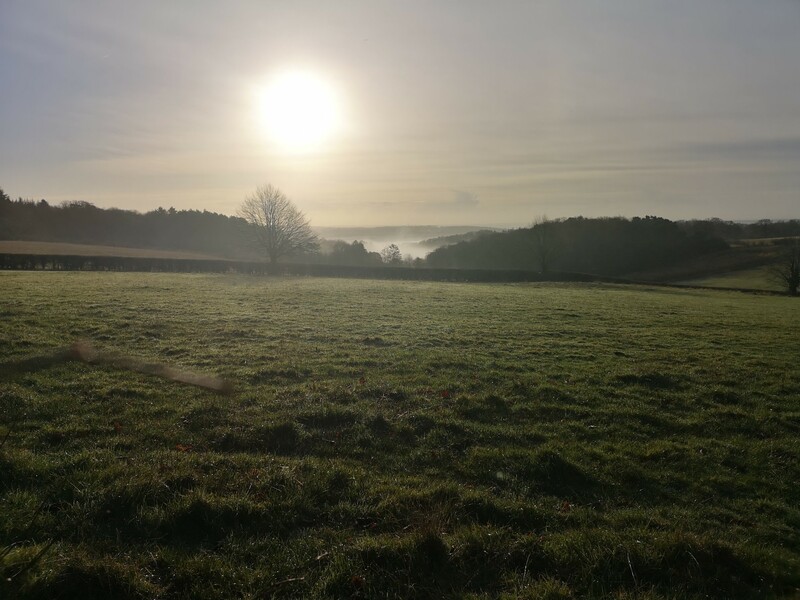 The first three pictures are looking back over the river Thames (number one is my favourite); number four captures most of the team just before we reach the Round House; number five is looking back towards the windmill by Turville; and the final one as we descend to Skirmett.